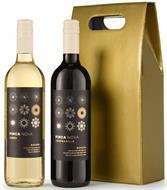 Two of our favourite wines, an Avenda Merlot and an Avenda Sauvignon Blanc, come together in one lovely Wine Duet hamper to make a lovely gift at a great price to treat a special friend or a colleague. A gift for every occasion. 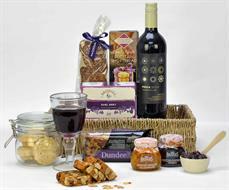 Treat your mum today with the Hugs for Mum Gift Hamper. Scented candles, a beautiful teddy bear and her favourite chocolates make this hamper one of our best sellers! Whether you're spoiling someone special or thanking a valued client, our Festive Fayre Christmas Hamper will dazzle your recipient! Once they open up the straps on this traditional wicker basket, they will be impressed with the array of festive foods from indulgent Holmes Bakery slices to a fine bottle of white wine. 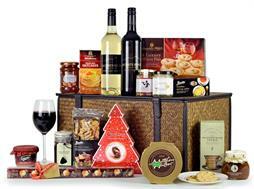 Our personaised Christmas Splendour is the perfect non alcoholic festive gift for clients or employees this Christmas! We will laser engrave your logo and gift message to the lid of the box for no extra charge! 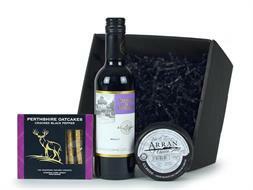 Our Cheese Lovers Choice is an excellent gift for any cheese lover, with wine and cheeses and a slate cheeseboard to serve up on to your guests.